These days, more and more daily tasks require the use of the Internet. Activities like online shopping, paying bills, entertainment, and more are all made possible through the power of the internet. Businesses large and small that advertise and market online will all be negatively affected if the FCC removes the net neutrality rules they set up in 2015. The rules were designed to protect an open and free internet by treating them like public utilities. This prevents companies from charging fees to prioritize traffic or services on their networks, unfairly giving an advantage to large corporations over small and medium sized businesses. What is happening on July 12th? Right now, the new FCC Chairman and former Verizon lawyer, Ajit Pai, has a plan to undo net neutrality and give big cable companies absolute control over what we see and do online. If they get their way, the FCC will give companies like Comcast, Verizon, and AT&T control over what content can be delivered to our Internet connected devices, with the power to slow down or block websites and charge apps and sites extra fees to reach an audience. If we lose net neutrality, we could soon face an Internet where some of your favorite websites are forced into a slow lane, while deep-pocketed companies who can afford expensive new “prioritization” fees have special fast lane access to Internet users – tilting the playing field in their favor. But on July 12th, the Internet will come together to stop them. 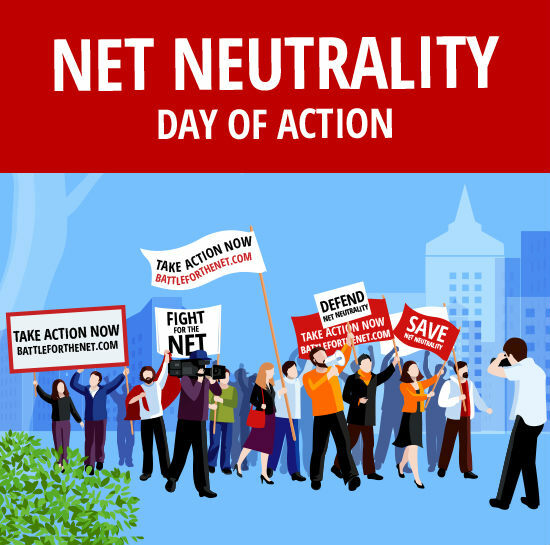 Websites, Internet users, and online communities will stand tall, and sound the alarm about the FCC’s failure to support net neutrality and competitive business practices. How could your website and online business be impacted? Major companies like Amazon, Mozilla, Twitter, and Netflix have also joined this day of action to help save net neutrality. These changes would negatively impact not only their businesses, but ours and yours as well. Instead of unique content, a responsive website, and marketing campaigns to build your online presence you may need to pay extra fees to prevent your site from being slowed down or even blocked completely. Site speed remains a factor in search rankings which means we would all be facing a “pay to win” scenario where to even be visible you would have to pay an entry fee. While it is difficult to say exactly what all will happen if the new FCC chairman successfully dismantles net neutrality you can be sure that it is not in your best interest. If you have ever been frustrated while waiting for your favorite Netflix show to load, then you can imagine how your website visitors would feel if the same thing happened to your website. At the very least make sure to stay informed and understand how issues like net neutrality impact your website. This article originally appeared in Ironistic.com. This article was written by Josh Hall from Business2Community and was legally licensed through the NewsCred publisher network. Please direct all licensing questions to legal@newscred.com.